As they say, you’ve got to make hay while the sun shines, which in Betty’s book means keeping supper simple in the summertime. And, it’s easier than you might think with the following tricks up your sleeve. The slow cooker is seasonless! It can make your barbecued ribs, just as well as your beef stroganoff, so don’t even think about relegating yours to the basement in the summer. Cold salads are more filling when protein-rich ingredients are added, like hard-boiled eggs, cheese, beans, and rotisserie chicken – by the way, your slow cooker can turn out a bird that beats the grocer’s any day! 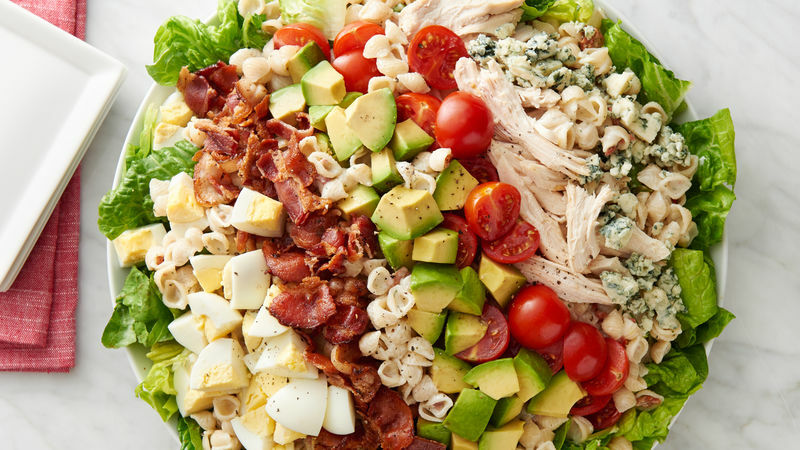 For a summer salad that combines almost all of these energy-boosting ingredients, try the new Cobb Pasta Salad. Keep grilling simple with easy-to-clean-up foil packs! You can pack a whole meal into a square of aluminum foil. Then, get to grilling while you sip a cool drink on the patio. Try the Low-Country Shrimp Foil Pack it’s perfect with summer’s most iconic veggie: sweet corn! When your summer schedule is bursting at the seams and everyone’s going in a different direction, we always count on sandwiches. They’re filling, easy and everyone loves ‘em. So, let barbecued beef cook all day in your slow cooker or take 15 minutes to whip up a chicken salad. Either way, everyone will end the day with a full belly.